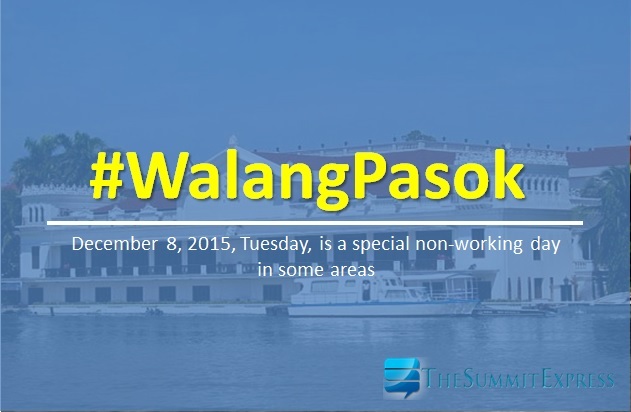 MANILA, Philippines - Malacañang Palace on Monday night declared class and work suspensions for tomorrow, December 8, 2015 in some areas of Manila and Luzon. Paquito N. Ochoa, Jr., Executive Secretary, by authority of President Benigno Aquino III announced that December 8 (Tuesday) is a special non-working day in Taguig based on proclamation No. 1175 as it marks the foundation day of city. Proclamation No. 1172 declared special non-working day in Antipolo City for the 424th Foundation Day on Tuesday. Batac, Ilocos Norte will also celebrate founding anniversary tomorrow. The whole province of Batangas will also be given full opportunity to celebrate and participate in the Foundation Day. The Municipality of Agoo, La Union marks the celebration of its 437th Foundation Day.